A somewhat random collection of thoughts and things I’ve learned along the way – that might be of use to others. Some of these ideas might not original – but if they are not, I’ve forgotten where I first got these ideas. This is a collection of short pieces – each not long enough to warrant its own Blog post. 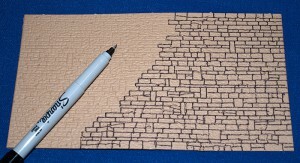 Most of the major suppliers of plastic structural models also supply sheets simulating stone walls. While these usually have a fairly realistic texture, their coloration and other detail often leave a lot to be desired. 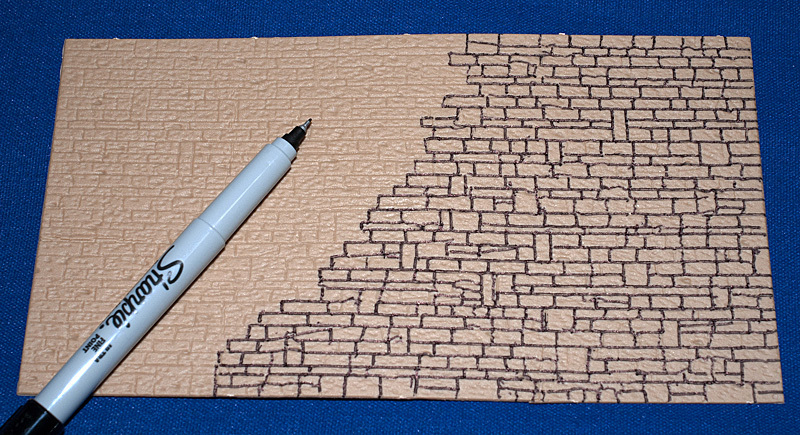 I’ve found that working the mortar lines with a fine-point Sharpie permanent marker is a quick way to improve these sheets. The first photo below shows the start of the process. Filling in the mortar lines. Then, overspray the entire sheet with a light coat of gray (pick your shade) paint – light enough for the black mortar lines to show through. Your model railroad equipment is as much electronics-based as any of the audio, TV, or computer components in your home. Do you have any of those shielded by power-line surge protectors? Why not? Though it’s been a number of years, I have had (non-model railroad) electronic equipment fried when lightning hit power lines near my then home. I now not only have surge protectors on most outlets in my home, but my computer equipment is all on uninterruptable power supplies (UPS) that not only stabilizes incoming power but also provides several minutes of battery backup for an orderly shutdown if the power goes out completely. Particularly for digital layouts, a UPS unit may not be such a bad idea, as it also allows you to do an orderly shutdown if the power goes out. That way, you won’t be surprised to find a train inside a tunnel when you resume operations many hours later. If you do get a UPS for your layout, be sure to get one with a high enough power rating. Items not normally considered model railroad accessories can be very useful in cleaning your models and layouts. Canned air: Office supply stores sell cans of compressed air for cleaning computers and other equipment. These can be used to get dust out of small crevices or off irregular surfaces of models. Plastic brushes: Small brushes with stiff bristles, such as those supplied for cleaning electric razors (and that used to come with so-called typewriter erasers) are useful for cleaning debris out of rail flangeways. If one of your turnouts isn’t functioning properly or prone to derailments, this may be caused by debris in the mechanism or one of the flangeways of the frog. The same is true for track that is set into “pavement.” These flangeways also accumulate debris over time and need to be cleaned out. We often complete structure kits before they are ready to be installed on a layout, so we may need to temporarily store structures. This would also apply to structures removed for major layout work or if we need to transport the structures to another location, such as a model railroad club or even if you end up moving. The obvious solution is to put the structures in appropriately sized sturdy boxes. The problem is that, unless the boxes are handled extremely carefully (which is not always possible during transport) the structures rattle around within the boxes, damaging small details or even breaking off parts. Adding bubble wrap or Styrofoam pellets is not really a solution, as those are also likely to damage delicate small parts. The solution is to temporarily attach the structures to the box. Use a small loop of masking tape, with the sticky side out. Put it on the base of the structure and press the structure onto the bottom of the box. This will keep the structure(s) secure, as long as the box is handled somewhat carefully. Larger structures may require more than one loop of tape. Use good quality making tape, as it will not only hold better but also be easier to remove later, without leaving any residue. The storage boxes that office supply stores provide for storing file folders are the right size for most moderate size structures – two to four floors tall in HO. Get the boxes that hold letter-size file folders in one direction and legal size folders in the other. One of these boxes will hold up to four HO structures. These boxes are usually sold flat, but are easy to assemble and quite strong. Even digital layouts usually require quite a bit of wiring as there are accessories and lights that you may want to turn on or off individually or in groups. Analog layouts with tracks divided into electrical blocks that can be turned on or off individually require even more wiring. Also, even digital layouts may have individually operated analog turnouts that require individual wiring. While most model railroad dealers carry at least some wires and multi-strand cables, two good sources for major wiring projects are telephone wire and old computer cables—at least for the smaller scales. So-called category 5 (cat-5) telephone wire consists of eight strands of color-coded wire within a single cable shell. These work quite well for wires leading to electrically operated switches or uncouplers or for various lighting accessories. These cables can be bought by the foot at many home improvement stores. Computer cables with anywhere between nine and 25 color-coded wires work well at locations where you may need to temporarily disconnect the entire cable. Cut the cable in the middle somewhere and plug the two connectors into each other. Hook the wires at one end to the lights or devices on your layout; the other end to matching toggle switches or controls. When necessary, you can disconnect the cable in the middle – and reconnect everything again very quickly. We’re all familiar with the black paper masks that are supplied with many plastic structure kits. They are intended to keep interior light from leaking through the plastic walls. The tape works not only in conjunction with the manufacturer supplied paper masks, but also lets you easily install masking where the manufacturer did not supply such a paper mask. Using your own black construction paper, simply cut out an approximation of the windows you want to illuminate. Then, use the black masking tape to precisely mask around the windows. This tape also works for eliminating light leaks around the base of a structure where it does not fit precisely on the surface below. Simply run strips of tape along the lower interior edges. On the outside, you can hide an imperfect fit with vegetation — but that won’t always stop light from showing through. Always plug hazardous tools, such as soldering irons, into a switchable outlet strip, which also has a lamp, plugged in. Do not switch this lamp on and off manually at the lamp. The lamp being on will remind you that there is a tool that is also on. When you are done with the tool in question, switch off the outlet strip and then unplug the tool. I hope these ideas are useful. Let me know. I plan to continue this series in the future. As always, comments are welcome.